Gene Heger started EdgeBuilder Wall Panels, Inc. in 2003 with the desire to better serve the commercial building industry. The concept was and is to pre-build interior and exterior wall structural components off-site for delivery on a just in time basis. EdgeBuilder added value to contractors by creating a faster build time (often taking weeks out of the build schedule with less weather exposure), less dumpster cost, precision cutting, and less site theft. EdgeBuilder’s proposition has proven successful for projects from small duplexes to large 100+ commercial office and dwelling units. 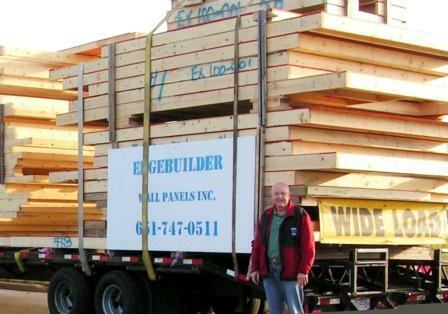 In 2005, EdgeBuilder began marketing its engineered permanent wood foundations (PWF). EdgeBuilder has its 16,000+ square foot wall panel production facility in Prescott, Wisconsin. All EdgeBuilder wall panel projects begin with architectural plans and are transformed into drawings for custom wall panels. EdgeBuilder estimators and designers work in full partnership with all levels of the contractor’s organization throughout the construction process. Under the stewardship of Gene Heger, EdgeBuilder Wall Panels and EdgeBuilder Panelized Foundations serve the entire Midwest area and offer sustainable green building practices, quality structural components, advanced design solutions, and competitive pricing. EdgeBuilder customers benefit from the highest quality and faster possession times, which lead to a more robust revenue model on commercial and residential applications. Call to request more information!